They don't make them like this anymore. In 2005, the famous studio BONES unleashed an anime that would become one of their all-time classics. 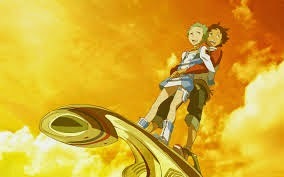 Eureka Seven. And yep, it's an original production of theirs. 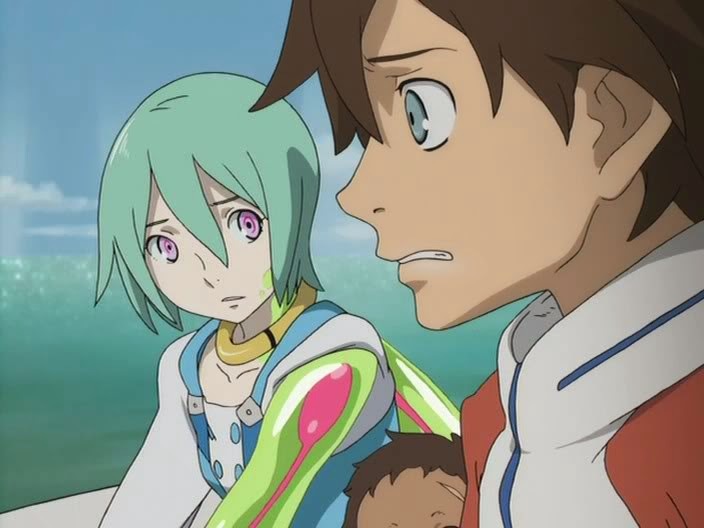 It's hard to believe how long it has been since I first watched an episode of Eureka Seven and even harder to believe that I never did finish the series. I encountered this series way back when I was fifteen and still very impressionable by anime, but also very wary of it. I was "growing out of it," as you might say. This anime made its American debut in 2006 on Adult Swim and that was right around the time I stopped watching anime. So when I decided to give this series another go on blu-ray I wasn't sure just what I would think of it. Well, it wasn't exactly nostalgia, but it was a moving experience. I had forgotten how deep Eureka Seven really was. I know a lot of mecha anime try to be deep, but none of them have really come close to that since Neon Genesis Evangelion (except for maybe Gargantia on the Verdurous Planet). And even Neon Genesis Evangelion didn't quite pull that off quite so well at the end once the budget started getting strained. I was expecting fun and robots and fights, but what I got was something different. I suppose I've just been watching too many shounen anime lately. 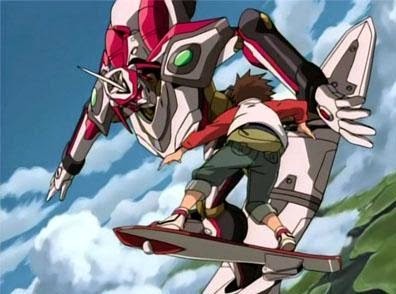 Eureka Seven certainly started out carefree. Renton Thurston is just a bored kid in a boring town that idolizes the crew of the outlaw Gekkostate and the magazine ray=out. What is Gekkostate? They are a crew that just goes around riding the waves and seeking out ways to pay for their rebellious lifestyle. And ray=out is their official magazine written by their onboard journalist Stoner. Of course, Gekkostate don't just exist to ride the trapars in the sky. They are also trying to uncover the secrets of the military and the regime that controls the world. Yeah, that's kinda why they are "outlaws" and not just "dirty hippies." This all gave me a bit of a 60's vibe and I think that might have been intentional since most of this series is about dealing with prejudices and racial tensions. In this anime the primary cause of tensions are the mysterious Coralians and if they mean any harm to humans. Of course, there are parties that wish to cause them harm simply because they are strange and mysterious, but then there is Holland and his crew of the Gekkostate. What the military is trying to do to the Scub Coral (Coralians) is exactly what Gekkostate wants the world to know. Hint: It ain't pretty. Renton doesn't know all of this as he impossibly finds himself on board the Gekkostate as a fledgling member of their crew. He thinks they are just out having fun. He doesn't realize that they are in the middle of a war and the machines they pilot aren't just used to destroy other robots, but to destroy the people in those robots, too. Not only is this anime about giant robots, but it is a coming of age story, too. It's also a romance. Onboard the Gekkostate, Renton finds himself instantly smitten with the odd Eureka even though Eureka doesn't appear to be a normal girl. For starters, she appears to not only talk to robots but also seems to be the mother of three children who are only slightly younger than Renton himself. Did I mention Renton was fifteen? As the series progresses through its 50 episodes the scope of the series expands beyond just the struggles for Gekkostate to make ends meet to the struggles of the entire world as the ruthless Col. Dewey Novak tries to eliminate the Scub Coral once and for all. How does Eureka, Renton, and the rest of Gekkostate fit into this? Well, they just happen to be the hope of the entire world. I think this is one of the greatest anime out there and it is definitely on my re-watch list. I can't believe I didn't finish it the first time. I'm not sure if I want to watch the movie or sequel now since I've heard so many bad things, but I think I might have to now. If I don't I might well come down with Desperation Disease. Not a pretty sight.